For this week's Unwound Wednesday, I'm taking a look at the 3rd Unwound box set from Numero Group. There's only one more to go after this and we're starting to enter into the territory of Unwound songs I'm not really as familiar with. Starting off with 1995's The Future Of What, this box set starts off with a bang. This is the last Unwound album I bought back in the 90's. I was starting to move on to other things around this time and while I really did like this record, I never loved it quite as much as some people. I'll stand by my claim that New Plastic Ideas is their best record. Listening to The Future Of What twenty years later, I'm much more struck by how good of a record it is. 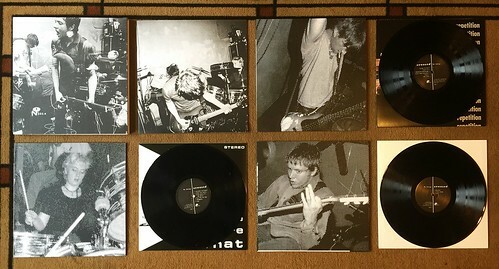 Unwound was definitely maturing in their songwriting and while they still had their share of noisy freak outs, the album is held together with a darker, bass driven undertone. By the time 1996's Repetition came out, I wasn't paying as much attention anymore. I'm sure I must have heard it at some point, but I never bought it and certainly don't remember much of it anymore. So for me, this was like listening to a brand new Unwound record (as will everything in the next box set coming out). I enjoyed Repetition way more than I thought I would and honestly, I can't figure out why I didn't like this when it came out. Especially considering that "Corpse Pose" is such a ridiculously good song. The last LP is a bunch of singles and rarities. Maybe they're not quite as strong as the songs on the LPs, but everything on here is also pretty darn great. As always, Numero did a stellar job with the box set. The original album art is recreated on the inner album sleeves, which are then encased in larger, sturdy cardboard sleeves. It comes with another incredible booklet with detailed writing about this stage in Unwound's history and everything is housed in in an outer box. If you've seen the first two sets, you know what you're getting into. This set is every bit as good as those. I can't recommend these Unwound box sets enough. For the price you pay (Less than some of the BS reissues you'll see on Record Store Day) you just can't beat the quality or all of the great music.